Using art & social media to raise awareness about deforestation – Milieu de la Moda, Inc. It was great news that UNESCO unanimously rejected Australia’s bid to delist a large of area of old growth native forest in Tasmania earlier this week (especially as these areas were only awarded World Heritage status last year). However, the battle is far from over and precious forests continue to be logged both here and overseas. I was reminded of this recently via some thought-provoking artworks in a range of media in Canberra. 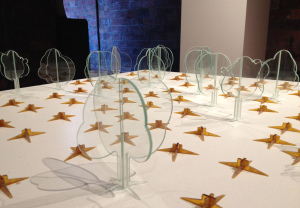 The first was an installation entitled ‘Unless’ (2013) by Sui Jackson at the Canberra Glassworks – where the artist wanted us to reflect upon how much a tree is worth and how long it takes to clear a hectare of forest. At the beginning of the exhibition, a large display table was covered with 100 small trees made from either clear float glass or stained glass reclaimed from old church windows in various shades of green and yellow.